Also serving communities of Eden. There are 7 Assisted Living Facilities in the Hamburg area, with 2 in Hamburg and 5 nearby. The average cost of assisted living in Hamburg is $4,046 per month. This is higher than the national median of $3,346. To help you with your search, browse the 50 reviews below for assisted living facilities in Hamburg. On average, consumers rate assisted living in Hamburg 4.4 out of 5 stars. Better rated regions include Orchard Park with an average rating of 4.4 out of 5 stars. Caring.com has helped thousands of families find high-quality senior care. To speak with one of our Family Advisors about assisted living options and costs in Hamburg, call (855) 863-8283. The city of Hamburg, New York is named after Hamburg, Germany. Located south of Buffalo, this city is famous for being a stop along the Seaway Trail, a National Scenic Byway that runs between New York and Pennsylvania. Because of its rich landscape, Hamburg could be an appealing option for seniors. Seniors already make up 15.1 percent of Hamburg's population, and thus there are 16 assisted living facilities in the Hamburg area - two directly within the city limits and 14 others nearby. These assisted living facilities, or adult care facilities (ACF), as they are referred to in the state of New York, are defined as centers providing long-term, non-medical residential services to adults who are unable to live independently and are regulated by the State Department of Health. The Hamburg area has no facilities from which to choose in the event of a medical emergency or illness, with the nearest major hospital located in Buffalo. Hamburg has an array of community resources for seniors, including the Hamburg Senior Community Center, an organization that offers an Aging Master Program via the National Council on Aging as well as aerobic and stability classes. Hamburg's cost of living is approximately 9 percent cheaper than the national average and 31 percent cheaper than the average cost of living in the state of New York. Seniors should determine how they want to spend their money when considering the cost of living in Hamburg. With an estimated average of 122 incidents of violent and property crime per year, Hamburg is recognized as safer than 56 percent of other U.S. cities. Because crime rates in Hamburg are near the average for all cities of its size in America, seniors can decide whether or not to live in Hamburg based on other reasons. With temperatures hardly exceeding 80 degrees, Hamburg maintains a colder climate. Though the U.S. averages 39 inches of snowfall annually, Hamburg experiences a mean of nearly 108 inches of snow during its winters. For seniors who prefer no snow and warm weather, Hamburg might be a less suitable option. The Niagara Frontier Transportation Authority is the local transit system within Hamburg. Through Erie County, seniors 65 years or older can receive a free NFTA Metro Reduced-Fare card. Assisted Living costs in Hamburg start around $4,046 per month on average, while the nationwide average cost of assisted living is $4,000 per month, according to the latest figures from Genworth’s Cost of Care Survey. It’s important to note that assisted living rates in Hamburg and the surrounding suburbs can vary widely based on factors such as location, the level of care needed, apartment size and the types of amenities offered at each community. 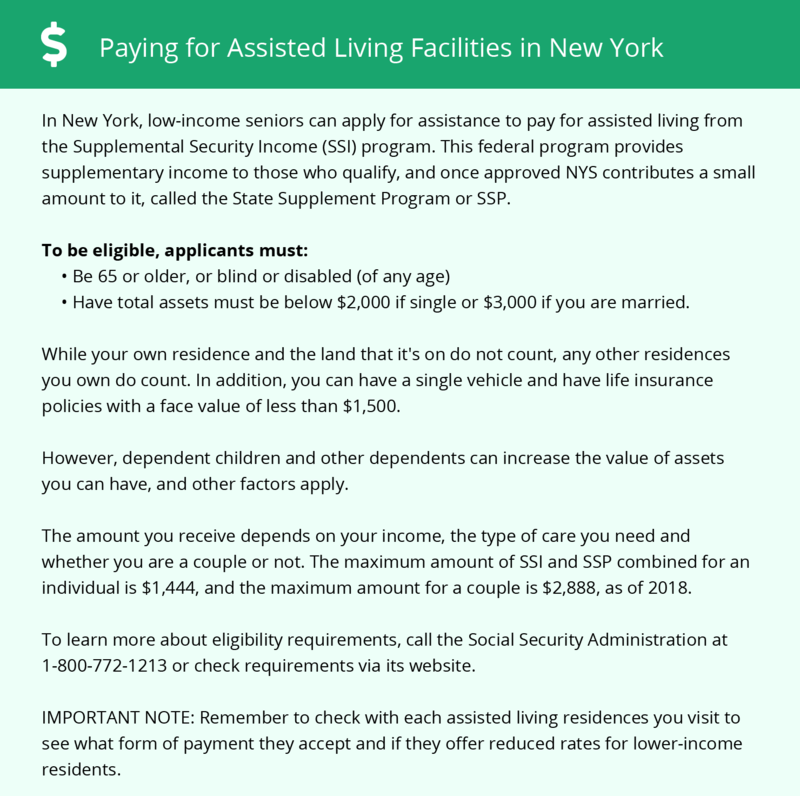 In New York, qualifying seniors can receive assistance from the Medicare program's Assisted Living Program (ALP) waiver. Up to 4,200 applicants (Medicaid recipients or self-paying) are accepted. Hamburg and the surrounding area are home to numerous government agencies and non-profit organizations offering help for seniors searching for or currently residing in an assisted living community. These organizations can also provide assistance in a number of other eldercare services such as geriatric care management, elder law advice, estate planning, finding home care and health and wellness programs. To see a list of free assisted living resources in Hamburg, please visit our Assisted Living in New York page. Hamburg-area assisted living communities must adhere to the comprehensive set of state laws and regulations that all assisted living communities in New York are required to follow. Visit our Assisted Living in New York page for more information about these laws.